I’m normally not a baker. I’m not that good at it and with just me and DH, we don’t need the extra calories of splitting a batch of something between the two of us. However, I USED to be quite the baker. I’d make something every weekend for after church. So I used the Sunday Supper Cookie Exchange as an excuse to try something new. This is not gluten- or sugar-free or vegan. But it is delicious! In a medium bowl, combine the flour, espresso powder, ginger, allspice and baking soda. In the bowl of a stand mixer (could also use a bowl and beaters) cream the butter until light and fluffy; add the brown sugar and beat until light. Beat in the egg and molasses until well blended. Add the flour, slowly, and beat until blended. Cover and refrigerate at least 30 minutes so it’s easier to roll into balls. Preheat the oven to 350F. Line 2 baking sheets with parchment paper. (Note: I ended up using three sheets). Scoop the dough about a tablespoon at a time, form into balls, and roll in sugar. Place 2 inches apart on the cookie sheets. Bake for 13-15 minutes or until edges are firm and the tops are cracked. Cool on wire racks while you make the frosting. For the frosting, beat the grown sugar, molasses, and butter together in a medium bowl until soft and creamy. Add the confectioners’ sugar and enough milk to make a spreadable consistency. Assemble by spreading about a tablespoon of frosting on the bottom of one cookie and place the other cookie’s bottom on top of that. The tops will be on the outside. The Verdict: I had expected the cookies to spread out and be a bit flatter, which would have made them easier to eat, but they were oh, so delicious. I’m glad I took the time to hunt down real espresso powder because the flavor is heavenly. Want even more cookie recipes? Check out the links below! « Jump Start Your Resolution! What a yummy combination! The brown sugar frosting sounds delightful!! 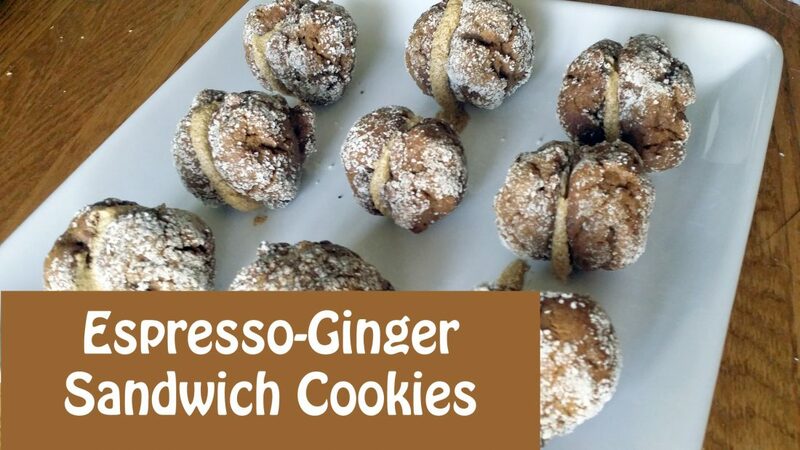 Espresso powder is perfect in cookies! Plus the ginger… wow! What a great combination! So glad you decided to join us. I love this recipe. Seriously, ginger and espresso would totally make my dream cookie and you made it happen. These look fabulous! My husband thought these looked good – I know if he read the recipe he’d say they sound good, too! I’m intrigued by the combination of espresso and ginger. I love espresso *anything* so if you say *cookies* along with it, I am right there! Yum!